Hubby and I recently came across Coochin Creek camping area, whilst out and about with the Camel Cuddles Farm Tour. A 'boutique-style' camping area is what springs to mind as an apt description for Coochin Creek camping, referring to the only twenty-one camp sites, rather than the facilities, which appear to be on the 'lean' side. I'm sure my readers might remember that my idea for a holiday, if it must be camping, would be to go the glamping route. My favourite mantras are: 'not working harder on holiday, than at home' and 'one does not go on holiday to lose weight'. The up-side to the Coochin Creek camping area, located in the Beerwah State Forest, is that this area is perfect for visitors - campers and day visitors - who love fishing and exploring the waterways, in canoes and small boats. Coochin Creek flows into the sheltered waters of the Pumicestone passage in the Moreton Bay Marine Park. 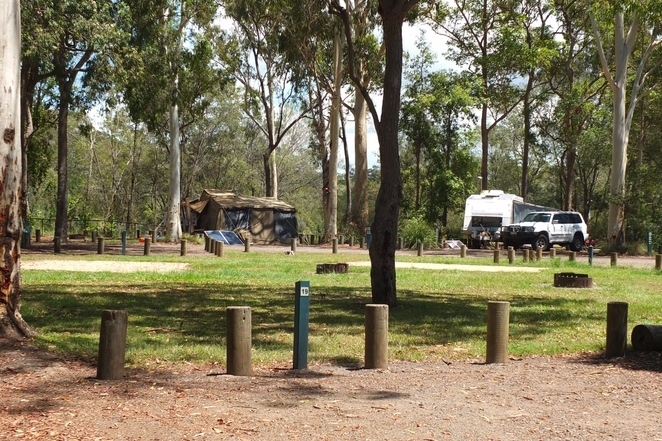 The Coochin Creek camping site can be found on Roys Road, about three kilometres upstream from the Pumicestone Passage. The proximity to suburbia is a bonus, especially if one has forgotten to pack something i.e. matches for the camp fire, drinking water and other important 'stuff'. The camp sites are numbered and individual camp site details are provided so that visitors can book the site most suitable for their tent, camper trailer, camper van or caravan. Another bonus: holidaymakers can reach the camping area with conventional vehicles - no bundu-bashing vehicles required here. A terraced area provides vantage points for fishing from the creek bank. A boat ramp is located about one kilometre from the camping area, whilst canoes or kayaks can be launched into the creek too, more than likely from the terraced area. The facilities at Coochin Creek include communal fire rings; water (though the water provided is not suitable for drinking purposes) and wheelchair-accessible composting toilets. Open fires are permitted at Coochin Creek but only in the fire rings that are provided. Campers are advised to bring their own clean-milled firewood and/or a fuel stove. It is illegal to collect wood from the State forest. Generator use is not permitted in the Beerwah State Forest. Domestic animals are not permitted at Coochin Creek camping area. Beerwah State Forest is open twenty-four hours a day and visitors are cautioned to only bush walk, drive or ride through the State Forest during daylight hours. Camping permits are required and camping fees do apply. Book your camp site online here. For day visitors there are picnic tables, wheelchair-accessible toilets and gas barbecues at both the Coochin Creek day-use area as well as at the Glass House Mountains lookout day-use area. School holidays are just around the corner and if you haven't managed to secure a getaway for the family yet, Coochin Creek camping in the Beerwah State Forest might just be a great short-term option.